The shooting in Connecticut on my birthday has been in the media for the past day and a half and I've read and participated in debates about gun control, and shed tears over the loss of life and compared this horrific event to the mass knife attack in China, also at a primary school, where every one of the 22 victims survived. For me the ugliest part of the aftermath has been the debate about God's role in the Connecticut shooting. Yesterday I read about Bryan Fischer and Mike Huckabee's comments on the shooting and I was appalled and dismayed that this tragedy would be used to point the finger of blame at non-believers, or even at believers who did not fight hard enough to enshrine Christian religious instruction or prayer into the school's everyday schedule. Essentially, another blame the victims attack which has come to characterise right-wise conservative politics in the US. There are so many things wrong with this attitude that I struggle to know where to begin. 1. God is omnipotent - I'm not sure people understand what this means. It means no one tells God what to do. God has been many places God is not invited, if you believe faithfully in the word of the Bible there are many instances shown of God being present and performing miracles where not invited. To suggest God is hamstrung by the lack of an invitation is to box God into a man-made constraints. 2. 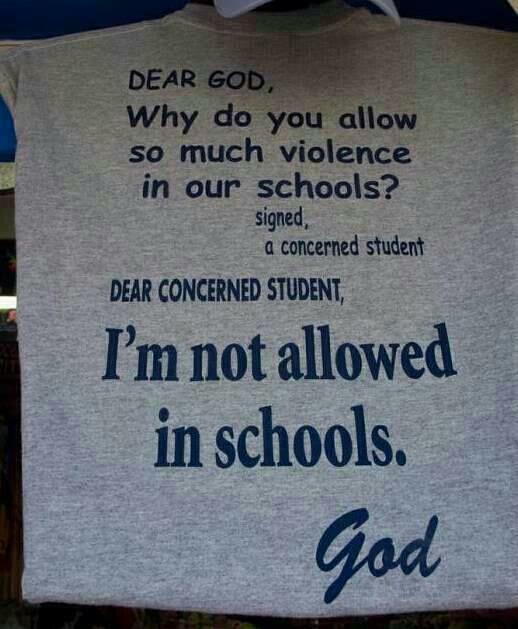 Let's say the non-believers did not invite God into the school, is God then not allowed to protect the believers who pray to him every day for coverage and blessing? I'm sure, amongst the number of murdered children, there were those who prayed to God every day, who read the Bible with their families every day - they may not have done so on school grounds, but I don't remember reading in the Bible that God's protection was subject to circumstance. As I understand it, the believer is under the grace of God at all times in all circumstances. 3. Who says God wasn't in the school that day? 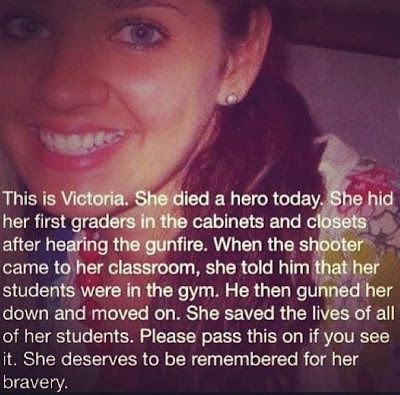 This is just one story of self-sacrifice and great love which has come from the Connecticut shooting - and I'm sure there are others. If this is not an example of God's grace, then what is? 4. Let's say the laws in the US were changed to bring back prayer to the schools and Bible readings and Christian religious education. Would no child ever die on a school ground ever again? Has no Christian child ever died in the house he or she lived in, where God was invited in on a daily basis? Would the non-believers be as protected as the believers? Would praying protect those who did not believe in their heart of hearts? There were doubtlessly children who believed amongst the murdered, were they penalised because their parents didn't fight hard enough to ensure God's invitation into schools? If God had an invitation, would he protect those who do not believe in him. What a fickle God man seems to be creating in the wake of this horror! How diminished by man is God becoming because children died and humans need someone to blame. Some blame God. Some blame the believers who didn't invite God onto school grounds. Some blame the non-believers who are quite happy for believers to believe, but not to proselytise to their children. Last thing I read, Jesus didn't play the blame game. Go love your children. Go pray to your God. Stop diminishing the omnipotent being you claim to worship. I will admit, I was worried about what I would find in this post, but I love your blog, so I followed the link. As a Christian, I love your words. I believe God was right there, holding the hand of each teacher fighting to protect the children, and wrapping His love around each precious heart called home to Him. Thank you. For such an understanding rational post. This atrocity had NOTHING to do with scripture in schools. It was, plain and simple, caused by evil and a disturbed mind. Let's keep the religion out of the politics, and look at what needs to happen to stop this happening again.